I'm not meaning to brag (ok, maybe I am), but I am a bit of a coffee connoisseur. I've been drinking coffee since an early age and my only steady job so far in Austin has been as a barista (the people who make your coffee at coffee shops, for those who aren't familiar with that term). I can remember going on an overnight field trip in 5th grade to Pensacola, Florida. 5th graders are just old enough to pretty much know how to fend for themselves and just young enough to not be able to stay in a hotel room overnight by themselves, so we had a chaperone. Our chaperone, Mrs. Sanderson, got up before we did that morning and made coffee before getting in the shower. She made plenty, so I decided to have a cup while I waited for the bathroom to free up. When she came out of her shower, she freaked out. I remember her screaming, "Oh my gosh! What are you doing? Put that DOWN! You can't have coffee! I'm going to call your mother and tell her you're drinking coffee!" My response was, "Ok, would you like her phone number?" So I'm not exactly sure at what age I started to drink coffee, but I know it was before I was in 5th grade. With all that being said, I thought I'd share my coffee knowledge with my lovely readers! 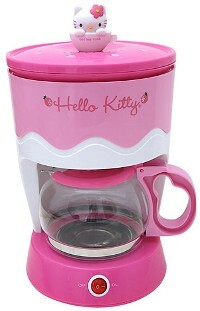 -Take your drip coffee pot (which is like the Hello Kitty one pictured above)and throw it in the garbage. No, I am not kidding. 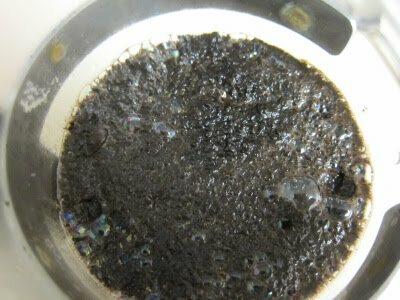 I have owned quite a few drip coffee makers in my day and they either don't work properly or don't make a good cup of coffee (yes, most of my coffee pots were pink, don't judge me). 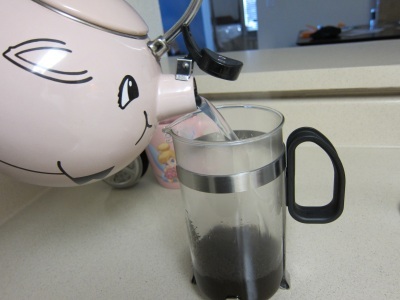 Instead, invest in a French Press, like this guy. I'm searching for a pink French Press, so for now I have a model similar to this from Ikea. Bodum is the better brand, but if you're strapped for cash a cheaper model will work just as well with some adjustments. -If you have very good tap water, you're welcome to use it. Mine isn't horrible, but I can taste the difference between tap and filtered. If you wouldn't drink your water from the tap, why are you making coffee with it? Did you know coffee is around 98% water? I always use filtered water when making coffee or tea. -If you have a coffee grinder, grind only the amount of beans you need for the pot you're making. If you don't have a grinder, you can go to your local coffee shop and buy beans there and they'll be happy to grind them for you, or you can even do it at your grocery store. Remember to keep them in a dark, cool (not in your freezer or fridge!!!) place in an air tight container. The shelf life of fresh ground coffee is only around 7 days but I usually go through about a bag a week anyway. 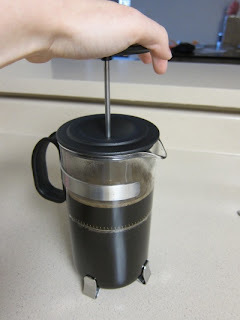 Also an important note about beans when using a French Press: when you French Press your coffee it makes it a bit stronger than normal coffee (due to grind, which I'll get to in a sec). If you like a medium roast you may want to start out with a lighter roast to see how well you can adjust before going back to your normal blend. Different coffee pots and coffee filters require different grinds of coffee beans. If you have an espresso maker you'll want a very fine grind. However since we're doing our French Press method, you'll need a very coarse grind. The more coarse the grind, the longer it takes for water to get through meaning you'll have a bit of a stronger flavor than if you used a regular drip coffee maker. Still with me? Now that we've gotten all those steps out of the way, the following steps are how to actually make your coffee. 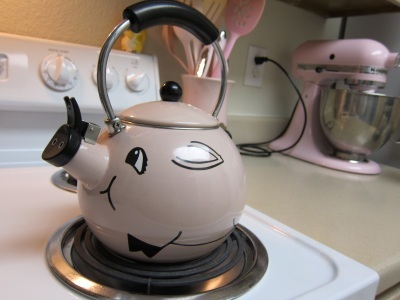 -Warm your water in a kettle (or in a pot if you don't have a kettle) on the stove until just before boiling. My kettle makes a funny noise before the water comes to a boil, so that's how I know. If it's a little boiling that's fine, you just don't want a roaring boil. -If you have a cheaper model French Press like me, you'll want to warm it before you actually put your hot water in it. I know it sounds a bit weird, but think about it: You're putting hot water into a very cool vessel, it's not going to stay hot for as long as you need it. To warm your French Press, run your kitchen tap until the water is hot and fill it with the hot water. That's it! That way when you put your coffee water in your French Press it's already warm and waiting. I usually warm my mug as well because I like my coffee pretty hot. -My French Press is 34oz. I usually only make half a pot at a time because that's roughly one mug full for me. However sometimes I'll do the whole 34oz. and refrigerate the leftovers for iced coffee later. It'll keep in your fridge for about five days, fyi. For doing a half a pot at a time I use 3 heaping tablespoons of (coarse ground!) coffee, if I make the whole pot, I'll use about five. You can adjust this to your liking. 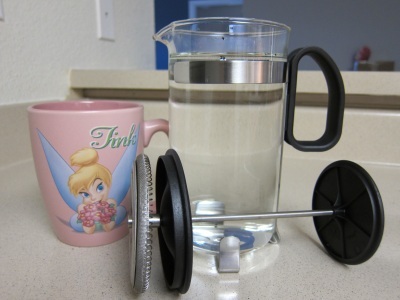 -Pour out your warming water, add your coffee, then add your water. Let it sit for around 1 minute. Take the handle of a plastic or wooden spoon or chop stick (something that isn't metal, metal leaches flavors and I'm always scared of banging the side of a hot glass vessel with a metal spoon. If you like to live on the wild side, you're welcome to go ahead!) and stir. You should have a nice crust on the top at this point, this is the coffee and oils separating from the water, and we don't want that, hence the stirring. After you've stirred, add the lid (don't press just yet!) and set your timer for 4 minutes. Walk away... (The longer the steep time, the stronger your coffee. 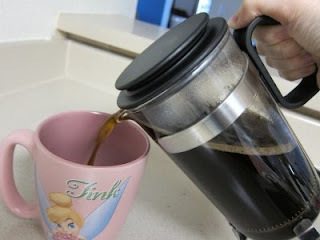 If you're not a strong coffee drinker you may want to start at 3 minutes and work your way up.) After the 4 minutes are up slowly press down on the French Press. If you've done a whole pot this process should take about 30 seconds, half that if you've done a half pot. 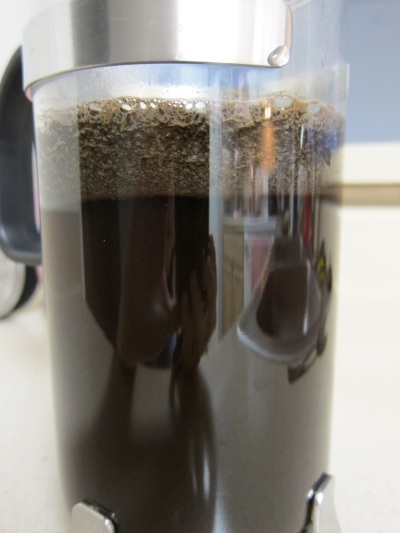 Again, this is making sure the water, coffee, and coffee oils are all blended together properly. You don't want to rush it! -After you've pressed your coffee, it's ready to enjoy! Pour into your favorite mug and add whatever sweeteners you desire. I'm currently using a Pumpkin Pie Spice cream and it's lovely! Cool post! DH was really into the French press a few months ago. But he's found this new device called and Aeropress and he LOVES it. If you have the chance, try it and then your opinion would be really appreciated. Thanks, Steph! Super-helpful. :) I just used *way* too much coffee in mine. Oops! Will def. read this post again before next time! What a great post! 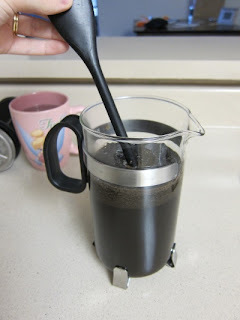 I have always wanted a french press but I had no idea how to use it. Thanks!